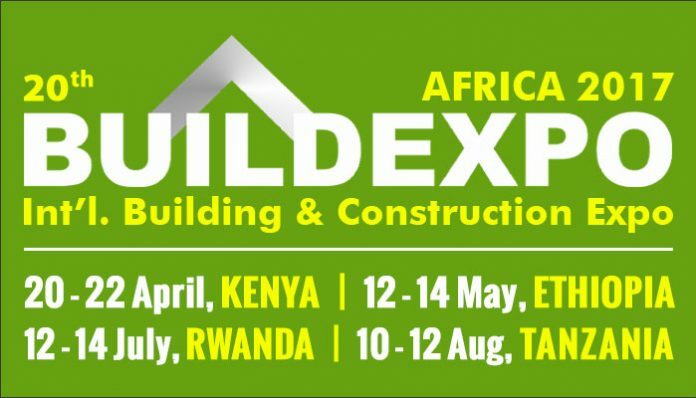 After the tremendous success of the 2016 edition, East Africa’s largest building and construction fair, BUILDEXPO AFRICA returns to Kenya and Tanzania with its 20th edition in 2017 along with new shows announced for Ethiopia and Rwanda. Last year’s event saw an exceptional turnout with exhibitors from over 40 countries and more than 5000 trade visitors, from over 22 African countries, participating in the event, making it East Africa’s most successful trade show. The latest technologies and machinery from countries like Germany, Turkey, China, Italy, India and Malaysia were on display, making it a truly global event. This year’s event promises to be even bigger and better with new features added to the show. As a proven platform for business transactions, the event will showcase the latest developments in the building and construction industry, with prominent industry experts, stakeholders and decision makers in attendance, making it an ideal event to source new products, network and usher in new contacts and business opportunities. Marking its 20th anniversary in the industry, Expogroup expands its ever growing presence in East Africa with the launch of BUILDEXPO AFRICA in Ethiopia and Rwanda. Both countries have one of the fastest growing economies in Africa and possess huge potential for investors and businesses looking to tap the market. This coupled with a favourable business environment and sound infrastructure makes both countries an attractive option for international companies. BUILDEXPO AFRICA will be held in Kenya at the Kenyatta International Conference Centre (KICC) from the 20th to 22nd April, 2017; in Ethiopia at the Millennium Hall, Addis Ababa from 12th to 14th May, 2017; in Rwanda at the Kigali Convention Centre from 12th to 14th July, 2017 and in Tanzania at the Mlimani City Conference Centre from 10th to 12th August, 2017.